There are 24 Assisted Living Facilities in the Wilmington area, with 15 in Wilmington and 9 nearby. The average cost of assisted living in Wilmington is $4,832 per month. This is higher than the national median of $3,346. Cheaper nearby regions include Hockessin with an average starting cost of $4,745. To help you with your search, browse the 185 reviews below for assisted living facilities in Wilmington. On average, consumers rate assisted living in Wilmington 4.0 out of 5 stars. Better rated regions include Kennett Square with an average rating of 4.5 out of 5 stars. Caring.com has helped 9 families in Wilmington find high-quality senior care. To speak with one of our Family Advisors about assisted living options and costs in Wilmington, call (855) 863-8283. Promotion ends in 2294 days! Seniors make up over 12 percent of the population in Wilmington, Delaware and there's much for seniors to do this area including museums, galleries, gardens and theatre. The Wilmington area also has 42 assisted living facilities, with 14 in the city and 28 in surrounding areas. The vicinity includes the states of Pennsylvania and New Jersey, but some of the nearby ALFs are located in other Delaware-based towns, like Hockessin and Newark. 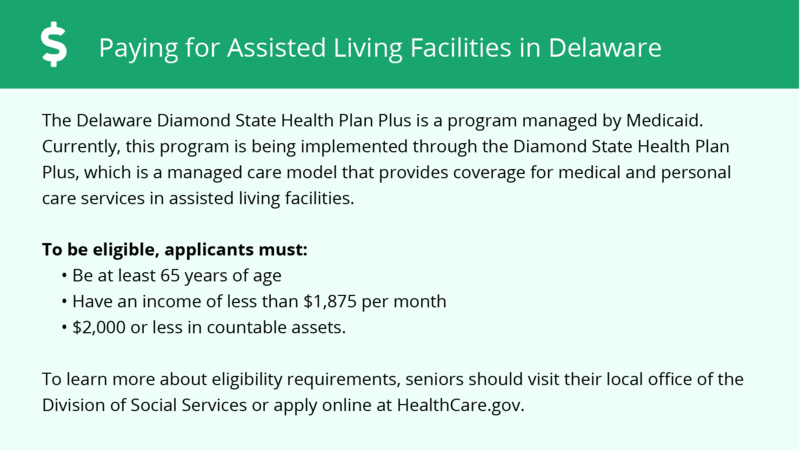 Assisted living facilities (ALFs) in Delaware are licensed by the Delaware Department of Health and Social Services (DHSS) to support people with activities of daily living (ADLs) in specialized housing. Wilmington offers plenty of seasonal variation, with average winter lows in the 20s and summertime highs in the 80s. The annual average temperature is about 55 degrees. Wilmington gets about 43 inches of rain and 19 inches of snow each year. The air quality is poorer in Wilmington than the national average. The city ranks 39 out of 100, with 100 being the best. New Castle County received an F for ozone pollution by the American Lung Association, which noted an increased risk to adults 65 and older and to those with respiratory illnesses. Wilmington is a high-crime area. Violent crime occurs much more frequently in Wilmington than the state or national average, and property crime is higher than average as well. The cost of living is lower in Wilmington than the Delaware or U.S. average, mostly from lower housing prices. Other costs such as utilities, health care and groceries are higher than the national average. Although the cost of goods can be higher in Wilmington, the sales tax rate of 0 percent may benefit the personal budget for shopping trips. Conversely, the income tax rate is about 2 percent higher than the U.S. average. Wilmington has an array of local community resources for seniors, including the Book Buddy Program, which delivers library materials to assisted living communities throughout the county, senior golf and softball leagues, the New Castle County Art Studio, which offers different types of art classes to people of all ages, and multiple senior centers and 55+ lifestyle centers, which offer wellness programs, dances, exercise classes and educational programs. Assisted Living costs in Wilmington start around $4,832 per month on average, while the nationwide average cost of assisted living is $4,000 per month, according to the latest figures from Genworth’s Cost of Care Survey. It’s important to note that assisted living rates in Wilmington and the surrounding suburbs can vary widely based on factors such as location, the level of care needed, apartment size and the types of amenities offered at each community. 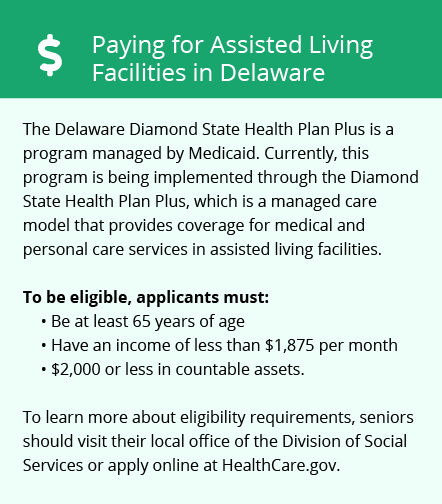 Delaware offers a state Medicaid waiver to help cover the costs of assisted living. People who receive Social Security Income (SSI) may be eligible for a state supplement toward room and board. Learn more about these programs, plus who’s eligible, on our Assisted Living in Delaware page. For more information about different ways to finance assisted living, visit our Assisted Living in Delaware page. Wilmington and the surrounding area are home to numerous government agencies and non-profit organizations offering help for seniors searching for or currently residing in an assisted living community. These organizations can also provide assistance in a number of other eldercare services such as geriatric care management, elder law advice, estate planning, finding home care and health and wellness programs. To see a list of free assisted living resources in Wilmington, please visit our Assisted Living in Delaware page. Wilmington-area assisted living communities must adhere to the comprehensive set of state laws and regulations that all assisted living communities in Delaware are required to follow. Visit our Assisted Living in Delaware page for more information about these laws.